DAYTONA BEACH, Fla. (AP) Brad Keselowski opened Speedweeks, before he turned a single lap, as the 7-1 favorite to win the Daytona 500. Indeed, Keselowski is one of the best restrictor-plate racers in NASCAR. Although he’s a five-time winner at Talladega in Alabama, his lone victory at Daytona International Speedway was in the 2016 summer race. When it comes to Speedweeks – The Clash, the Thursday twin qualifying races, and finally the season-opening Daytona 500 next Sunday – Keselowski always came up empty. His best finish in the Daytona 500 was third in 2013, and he finished fourth a year earlier. In his prior appearances in the all-star Clash, Keselowski finished inside the top-nine in four of his five races. 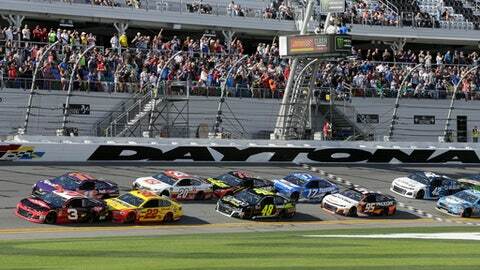 ”It was a good day, a great start to Speedweeks, and now there’s two more to go,” Keselowski said. The 17-car field is set by a draw and Keselowski started last. He had 75 laps to race his way to the front, which was easy enough for the three-car Penske contingent. Keselowski had the race in control as the Penske drivers closed in on the checkered flag. ”I was worried about the (competitors) but the car was way overheating there at the end and I was more worried about it blowing up than anything else,” he said. Ryan Blaney pulled out of line from behind Keselowski on the final lap in an attempt to beat his teammate, but he was left alone in the bottom lane and faded into traffic. Joey Logano didn’t have enough help to mount a challenge on Keselowski and had to settle for second. ”It is fun when you are up there running and you don’t know what is going to happen,” Logano said. ”The suspense keeps building as you are running single-file: three to go, two to go, here comes the white flag – when do you make the move? Do you make a move? Sometimes you make and it is never the right thing. Blaney faded to fourth, behind defending Daytona 500 winner Kurt Busch, as Ford drivers took the top four spots. It was a nice rebound from qualifying earlier Sunday when the fastest Ford driver was Kevin Harvick at eighth. ”I thought we were in a good spot. Even though Brad is one of the best at doing this, I thought we had a good chance at it,” Blaney said. ”I probably didn’t pull out at a very good time. I thought it was enough, but I got hung out.